A transponder key is a car key that has a transponder chip inside of it. This is an additional security measure meant to increase the levels of proper user verification. The chip gives off a signal that communicates with your car’s transceiver. The transceiver is looking for the correct signal, so if there is no signal or the incorrect signal, the car will not start. A car that requires a transponder key will not work without one. A key without the proper programming will still open the car doors, and trunk, but you will need the appropriate transponder key programming in order for the car to start. Do I need to program my transponder key? 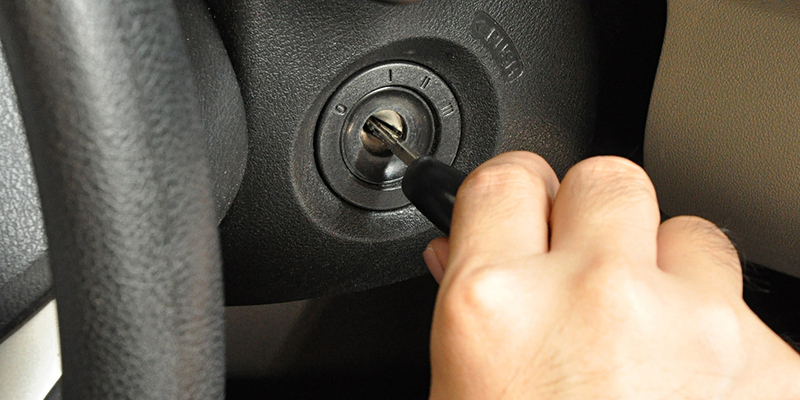 If you want your key to work in the ignition of your car, you must program the transponder key. Transponder key programming is not necessary for every single car. 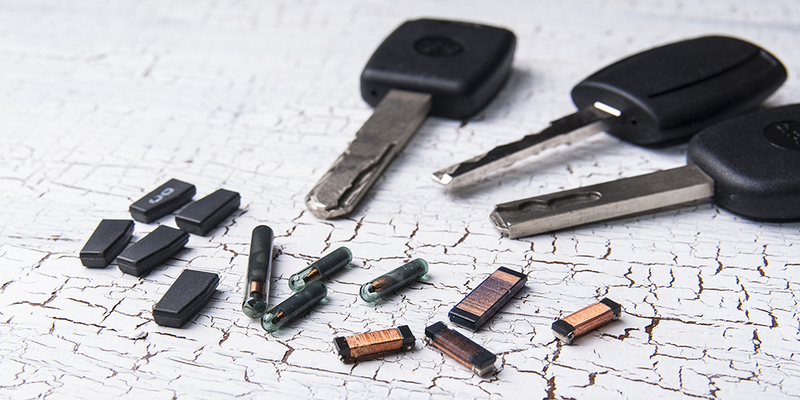 Some older vehicles only use the standard metal key with no supplemental electronic components. In the instance that you do not want a key that will start your car, and all you are looking for is one that will open your exterior locks (doors and trunk), there is no need to program a transponder chip. When you have a transceiver in your car, there is no way to get around transponder key programming without undermining your own security. Take a look at your car key. There is the metal piece that you place in the ignition (blade), and a larger flattened piece that you will use to turn the key once it is inserted (bow). If the bow of the key is covered in a plastic or rubber shell, then there is a good chance that there is a transponder chip inside. To be certain that this is the case, you can remove the plastic covering and look for the chip. It is very important that you do not scratch or damage the chip during this process because that will make the key unusable in the ignition. You could also copy the key using a key cutter and see if it will start the car. If you attempt to start the car with just a metal key, keep the working key out of the vehicle, as this may give you a false positive. The most foolproof method is to call the automotive locksmith. They can check to see if the key uses a transponder chip, and complete the transponder key programming if you would like to make a new fully functional key. Do I need to purchase a new key? If you would like to have another key, you or your local locksmith can make this purchase. In the event that you would like to purchase the key yourself, be wary of secondhand keys. These will be near impossible to recut, and are most likely already programmed. Once the transponder key programming process has taken place, that chip cannot be reprogrammed to work with another car. The key must be blank. That means that there are no cuts made and that the transponder chip has never been used. The key must also be appropriate for the car. If the key does not have the proper shape, then it will not fit into the keyway. Whenever you want someone else to do the work, trust the company that is going to do it right. United Locksmith always has your best interests at heart. Let us help you with every step of your transponder key programming. How long does it take for transponder key programming? Transponder key programming only takes a few minutes. This can be done with just the keys, or at the car itself. Additional time will be added if the key in question needs to be duplicated. If there is no key to duplicate, that is no problem, as our locksmiths can cut you a brand new key from code. This only requires us to take down your VIN (Vehicle Identification Number), and then the new key can be cut. All of these tasks do not take long, but they do add up. United Locksmith always ensures that services will be delivered in a fast and efficient manner. However, speed will not sacrifice quality. Trust the company that can do it all, and offers if all fast and for a fair price. Does programming include a key cutting service? Transponder key programming is a separate service from key cutting, but all of our technicians are equipped to do both. Programming a key will not do much for a key if it has not been cut. The key will need to fit into the ignition of the car in order to start the automobile. The transponder chip is not the sole form of user identification. It must be used in conjunction with a properly cut car key. Just as a cut key will need transponder key programming to work in the ignition, the chip needs to have a key cut so that it can work in the ignition. Can I program my transponder chip myself? In some cases, you will be able to program your own transponder chip. Most often, this type of reprogramming will require the use of two working keys, but that will depend on the type of car you have. Transponder key programming can be tricky if you are trying to do it yourself. Each vehicle has its own process pattern and programming method. You will need the exact information as it relates to your car if you would like to do this process yourself. From there, you will need all of the proper supplies. Rather than get frustrated by wasting time and money on methods that may not work, trust a locksmith to do it right the first time. There is no better way to be protected than to have extra keys to the things you own. Rather than waiting to lose your keys, you should get a new one made while you still have a spare. Once you postpone until an emergency, you will be strapped for time. This is then likely to require more time, as more services will be required. Preparedness is security, so always fight to be prepared for what the world is going to throw at you. Whenever you are in the market for a new car key, it is always important to have a company that can provide you with all the services you need. Thanks to our mobile locksmiths, there is no location that is beyond our reach. United Locksmith can get you all the help you need, and deliver it straight to your location. We have quick arrival times for emergency services and are available at your convenience, by appointment. We offer 24-hour locksmith service to make sure you are getting what you need no matter when you need it. When our technicians arrive to assist you with your transponder key programming, they will have all of the appropriate equipment. This includes a key blank if you have not purchased one on your own. If you require a duplicate, the key will be able to be cut on site. In the case that you would rather have the key cut by code, that can be handled prior to arrival as long as this is not an emergency call. Once the locksmith arrives, they can use an existing key or the car itself to program keys. This is done with one of our transponder key programming tools. But that is not all that these tools can do. Transponder key programming does not just end at making sure a new key can start your car. With a professional locksmith, there are more services that transponder key programming can include. The existing keys can be erased from the system. This is monumental if you have been losing the keys or do not know the whereabouts of some of your keys. Essentially the locksmith can make it so, the old transponder signal is not accepted by the automobile’s transceiver. Transponder key programming can double as a sort of reprogramming. This offers customers better protection than what would be delivered by simply replacing the keys that may have been lost or stolen. If you would like as many options as possible for your transponder key programming, then it is best to get your car keys programmed using the vehicle. Some types of car will require the key to be programmed inside of the vehicle. This will make sense in those cases, but it also affords you additional capabilities. In car transponder key programming, a chip can be programmed without any existing working key. Once the key is cut by code, all you need to do is turn over your automobile to a trusted locksmith, and they can find the code that your transceiver is looking for. That code can then be copied onto a blank key. And the key must be blank and un-programmed, so be aware of the dangers of getting aftermarket car keys. In case that you would like to have all of the existing keys to the vehicle erased, that can also be done at this time. All the technician will do is access your car’s onboard diagnostic port. Once this port has been exposed, our tools can be used to access the vehicle’s computer. These types of processes can take a while because the systems on our machines are built with waiting periods. These are sometimes referred to as authentication periods. These waiting periods in the programing process means that the machine imposes a longer wait time. This prevents the quick usage of the device for illegal means. There is no need to worry, though, because although our machines behave slowly at first, or technicians make up for the wait time with fast service. Some car keys can be programmed using an existing key without involving the car at all. This is not the case for all keys and all cars. In some cases, even if a transponder key programming is done at a separate location than the vehicle, there is still some amount of mechanical key manipulation that will need to be done inside the automobile. Your locksmith can inform you on any type of secondary procedure. The locksmith can also do this process if that is more convenient for the customer. If you can use this service, your locksmith will tell you. In the event that the car is needed for all of the transponder key programming, they will help you with that process as well.